Check our Facebook page at 8:30 AM for inclement weather decisions and locations. Keep Up With SLAM'n Fayetteville! Join SLAM Fayetteville on Instagram! Contact the SLAM Fayetteville Team! Amy Schwartz is an ACE certified group fitness instructor and is a certified coach for RRCA level one. She has a bachelors degree in Health Science and is a previous preschool teacher. She has been living in Fayetteville, NC since 2011 with her husband and six children, who love to work out during school breaks. 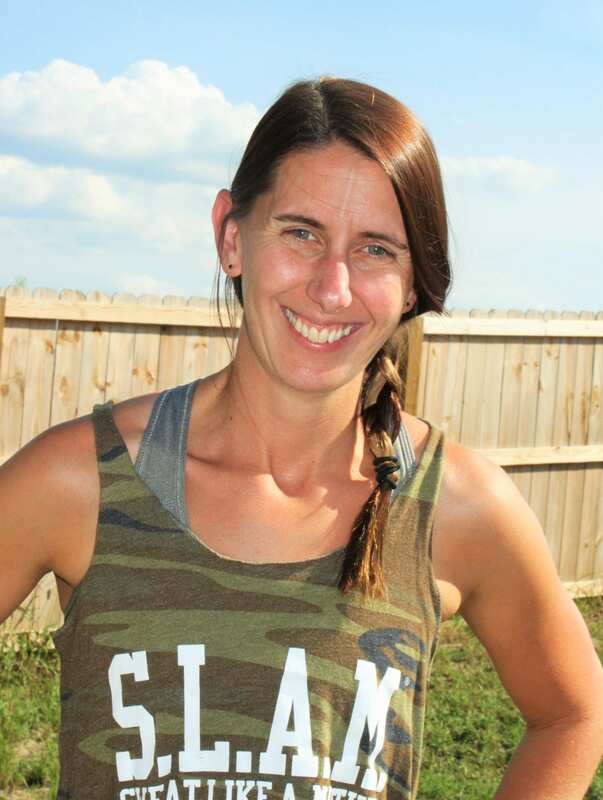 Amy loves to sweat like a mother by running, lifting weights and high intensity workouts. Virginia Ladner is a stay-at-home military wife and mom, a RD (registered dietitian), and a certified AFAA (Athletics and Fitness Association of America) primary group exercise instructor. She is also CPR/AED certified through the AHA (American Heart Association). She joined the SLAM family in 2016 after being introduced to the group by Leavenworth SLAM boss, Meghan Argo. She SLAM’d with the Leavenworth group from 2016-2017 until her husband, Pattrick, was reassigned to National Guard Bureau in Arlington, VA the summer of 2017. 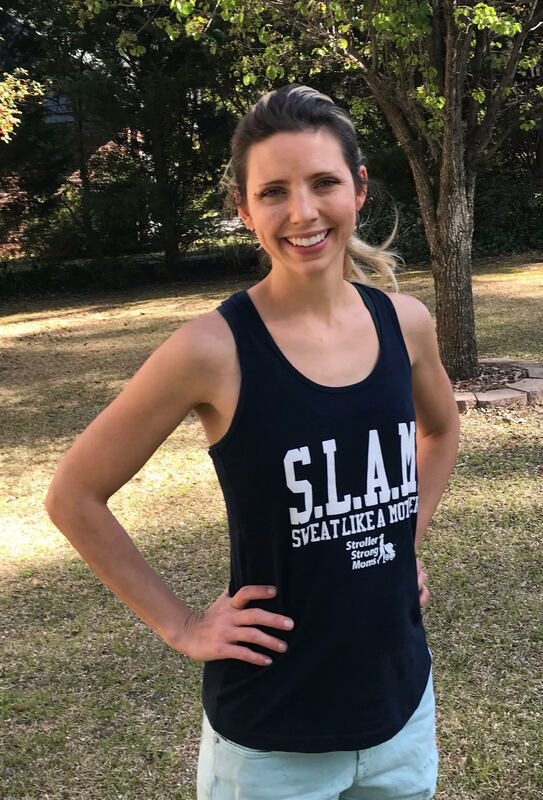 She quickly got involved with the SLAM DC group and even served as one of the dietitians during their 2018 ReFresh challenge. Virginia started coaching with SLAM Fayetteville after the military moved her family to Fort Bragg, NC the summer of 2018. She has an almost 3-year-old daughter, Savannah, and a 3-month-old son, Elijah. Virginia loves to dance and sing and is even licensed to teach Zumba, which she practices on the SLAM mommas in Fayetteville every time she can when she coaches. 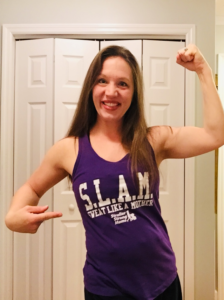 She loves being able to workout and instruct with her kids by her side and the fact that SLAM has been a constant in her transient life since joining the group in 2016. Finally, she appreciates the love, encouragement, and support she gets from all her fellow SLAM mommas. Emily Ratliff is an ACE certified group fitness instructor and certified in CPR/AED. She discovered SLAM in Leavenworth, Kansas while looking for a workout group following the birth of her son. She was hooked after the very first class and decided to make SLAM her tribe. Emily is an Army spouse and currently calls Fayetteville home. She and her husband, Timothy, have three wonderful, energetic children. Prior to joining SLAM, Emily worked as an instructor for the Department of Defense and brings with her a passion for educating and working with adults. In her almost nonexistent free time, she enjoys running fast, walking slow, and reading good books. Amy Schwartz is an ACE certified group fitness instructor and is a certified coach for RRCA level one. She has a bachelors degree in Health Science and is a previous preschool teacher. She has been living in Fayetteville, NC since 2011 with her husband and six children, who love to work out during school breaks. Amy loves to sweat like a mother by running, lifting weights and high-intensity workouts.